Use our social sharing tools! Visit our Refer A Friend page or your member account and use our new sharing tools. It is as easy as clicking a button and we will automatically share your personal link and message via Facebook, Twitter, and Email. Personalize it for the best reaction! Nextdoor / Community Listservs. We hear from new members all the time that they heard of us through NextDoor or via a Community Listserv. 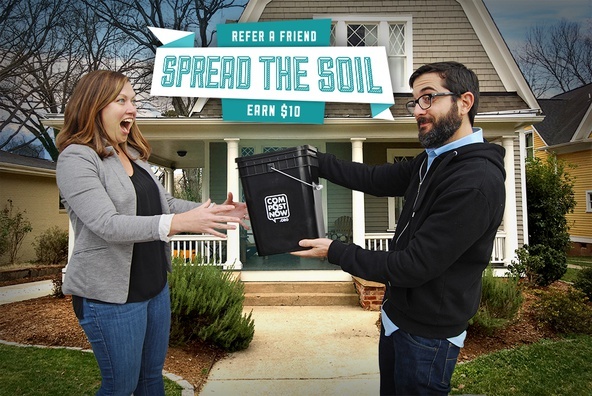 Be the first in your neighborhood to share your personal link and become a composting champion! Click here to share on NextDoor! Good ol’ Personal Touch. Looking to impress your friend? Next time you see them let them know you have a special two-week trial offer just for them. Or, if in-person conversations aren’t your thing, send them a text message with your personal link. Share with co-workers. Most office managers are happy to send out an email to all employees with a special offer. Or just bcc everyone! Sustainability Networks / Blogs. Part of a sustainability minded Facebook group? Do you have a favorite blog? Do you write for a blog? Make sure you include your personalized link when sharing CompostNow! Any other sharing methods work for you? Let us know and we will include them to this blog. Happy sharing! Thank you for your help in growing a composting movement!